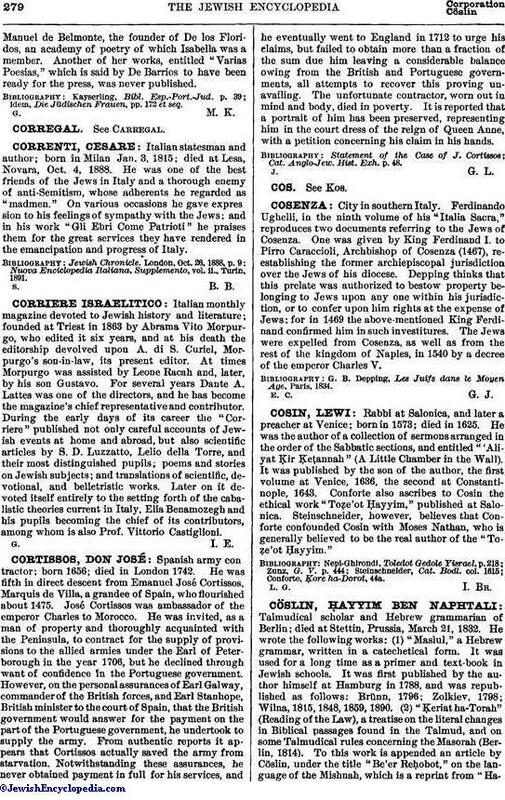 Rabbi at Salonica, and later a preacher at Venice; born in 1573; died in 1625. He was the author of a collection of sermons arranged in the order of the Sabbatic sections, and entitled "'Aliyat Ḳir Ḳeṭannah" (A Little Chamber in the Wall). It was published by the son of the author, the first volume at Venice, 1636, the second at Constantinople, 1643. Conforte also ascribes to Cosin the ethical work "Toẓe'ot Ḥayyim," published at Salonica. Steinschneider, however, believes that Conforte confounded Cosin with Moses Nathan, who is generally believed to be the real author of the "Toẓe'ot Ḥayyim."